This is a collection of the best architecture WordPress themes designed for architects, architectural companies, design agencies, property developers and other related businesses. These premium themes are ideal for showcasing your services, projects, and publishing information and news about your company to attract new clients. Architekt is a modern and stylish business / corporate WordPress theme perfect for architects, interior design consultants, designers, development project websites or anything else. The premium theme from ThemeFuse has contemporary corporate feel with a touch of style and refinement. Its easy to use and fully customizable with multiple slider options, visual drag and drop page builder, built in page layouts, Google fonts integration, and more. 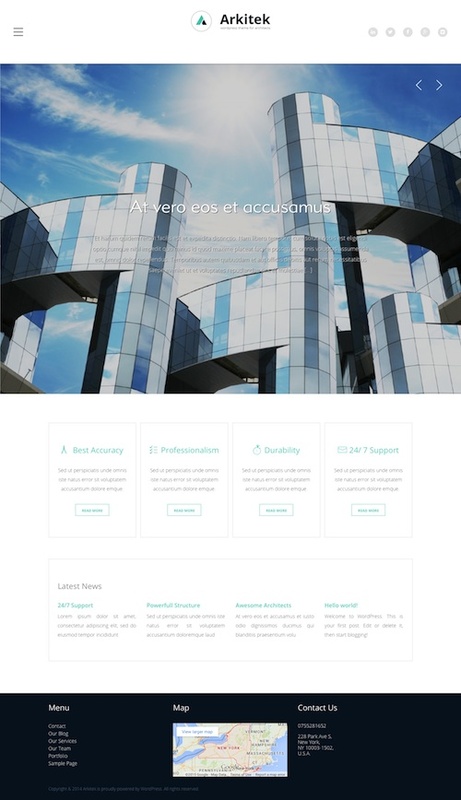 Koehen is a professional business WordPress theme from CSSIgniter. The premium theme has a bold, minimal and modern design perfect for showcasing your business and or projects. The theme would be ideal for architecture and building construction companies, or any other type of business. It features a drag and drop homepage, flexible layout options, custom widgets, translation ready and more. 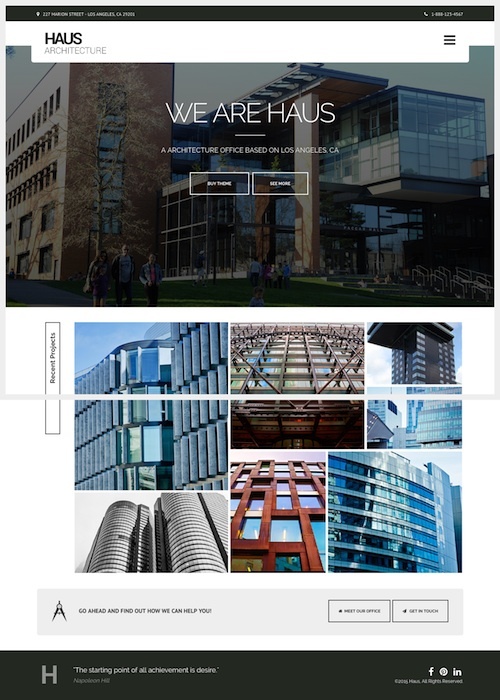 Haus is a minimalist WordPress theme for architects. 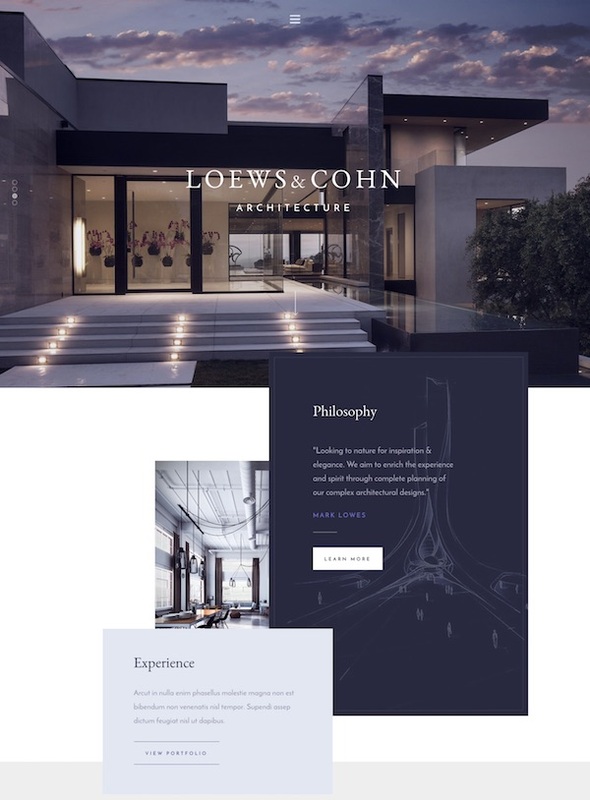 The premium theme is suitable for freelance architects or large architecture firms and has a clean, modern and minimal design ideal for showcasing your projects. Some of the key features include: a 100% responsive design, visual composer, portfolio filter, blog section, Google fonts, smooth scroll, Font Awesome icons. Its built with HTML5 / CSS3 and powered by Bootstrap 3. Workstation Pro is a great looking multi-purpose WordPress theme from StudioPress. The premium child theme for the Genesis Framework has a really modern, clean and open design that lets you showcase and highlight your products, services or projects with large, dramatic images and elegant typography. It would be ideal for creative studios, one personal shops, designers, architects, or any other type of business or portfolio website. Some of the key features include: custom homepage and header, accessibility ready, mobile responsive, neutral color palatte, theme customizer, theme options, landing page template, modern typography, translation ready, HTML5 markup, and all the other features and benefits of the rock solid Genesis Framework. 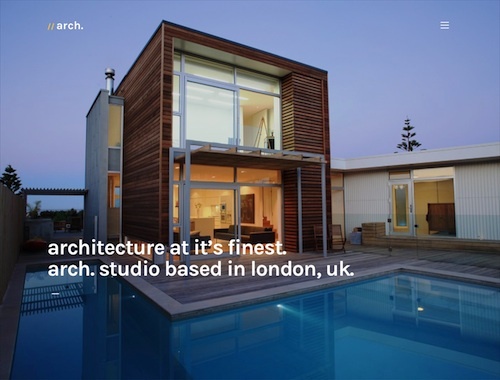 The Architect is a great looking WordPress that’s been designed specifically for the needs of architects and design agencies to showcase their projects and display their company news, updates and information. The premium theme from WPLOOK has a modern, professional and flat design that will impress potential clients and visitors. It’s mobile friendly and features unlimited color scheme options, advanced theme options for easy customization, projects page, custom single project page and post type with large hero image, multiple widget areas, flex slider, microformats, drop down menus, full HTML5 and CSS3, and more. Interior Pro is a multipurpose business and portfolio WordPress child theme for the Genesis Framework. The premium theme has a stylish and professional design ideal for showcasing your projects and skills. It would be ideal for interior design businesses, designers, architects, and other small businesses. It has a custom homepage with welcome intro text and space to display other content. Some of the other features include: a mobile friendly responsive design, landing page template, multiple column classes, custom page templates, theme options and theme customizer support (tweak colors, backgrounds, content etc), 7 widget areas, customizable header, and more. It also has all the other great features and benefits of the Genesis Framework which powers your theme such as: super fast page load times, one click updates, rock solid security and more. 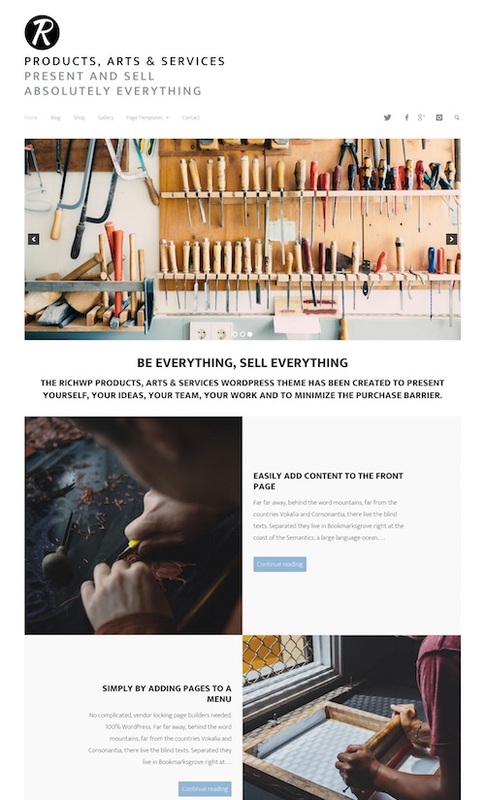 The “Products, Arts & Services” WordPress theme is a minimal multipurpose business WordPress from RichWP. The premium theme has a beautiful minimalist design crafted to present yourself, your business, your products, your ideas, and your work in a way that will lead your customers to purchase whatever you’re selling. You can use the theme for a simple one page website or a large complex site. It would be ideal for architects, designers, artists, and anyone else. The “Products, Arts & Services” theme has been created with simplicity and ease of use in mind. There are no complex page builders or vendor “lock-in” functions, just 100% WordPress for a future proof website. It does however have a handy set of features and support for quality plugins. Some of the key features include: a fully mobile responsive design, WooCommerce ready (for ecommerce), JetPack gallery and forms support, easy logo integration, color customization options, custom page templates, menu navigation options, multiple widget areas, RTL language support, and more. The Capitol WordPress theme from 7Theme is an attractive and uniquely designed theme suitable for architects, architectural firms, home builders, freelancer, engineers and others. It allows you to showcase your portfolio of work and projects in a stunning and creative way. The theme has a high contrast design with bold header and the homepage allows you to display your projects and team members. Some of the other key features of the theme include: 3 different header types, unique portfolio pages, mobile responsive, post types for team, portfolio and testimonials, unlimited colors and backgrounds, lots of options for customization and more. Kalium is a creative WordPress ideal for architecture websites and companies. The premium theme has plenty of different layout options plus a drag and drop page builder so you can create your site the way you want. Some of the other key featurs include: a variety of unique portfolio styles, lots of single product / project layouts, lots of hover styles, extensive options panel for customization, Google fonts, mobile responsive, multiple footer styles, WooCommerce support and styling and more. 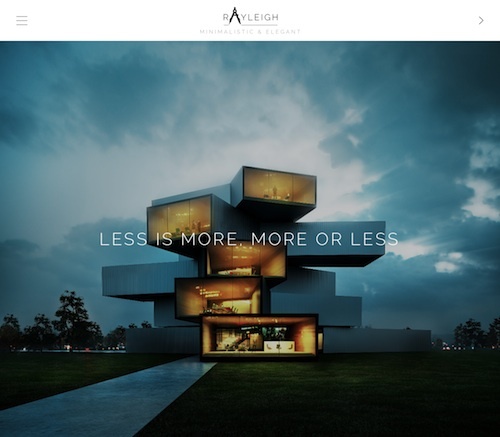 The Architecture WordPress theme has a minimal and modern design specifically created for architects and designers. The clean and minimal black and white design showcases your projects nicely. It has an advanced theme options panel for easy and extensive customizations, drag and drop page builder, mobile responsive design, gallery and portfolio post types, and more. Shutterbox is a premium multipurpose portfolio WordPress theme from Graph Paper Press that allows you to create a fully integrated portfolio, blog and ecommerce website. The theme is ideal for photographers, artists and other creative wanting to display their portfolio in a beautiful minimalist full-page grid layout. It has a heap of customization controls and includes: optional header images, numerous gallery layouts, mobile responsive design, customizable homepage, integration with the Sell Media plugin so you can sell photos, prints and more. The Eiffel WordPress theme is perfect for showcasing your architecture projects. It has a clean, minimalist and professional design that places the focus on your designs and company information. The premium theme from 7Theme is mobile responsive and is highly customizable (colors, fonts, backgrounds sections etc). It has advanced typography options, drag and drop slider management, unlimited slideshows and portfolios, mega menu, CSS3 animiated content, and more. The Arctic WordPress theme has a sharp, clean and minimal design ideal for architects, designers and creatives to showcase their work. Some of the key features include: mobile friendly and retina ready, full Ajax, WooCommerce support, light or dark color skins, 8 different page templates (Clients, Contact, Home, Projects Grid, Projects Horizontal, Home Fullscreen video, Services, Team), full screen home slider or full screen video homepage, menu on the top or bottom, animated menu, Google maps, Google fonts, rich options panel and more. 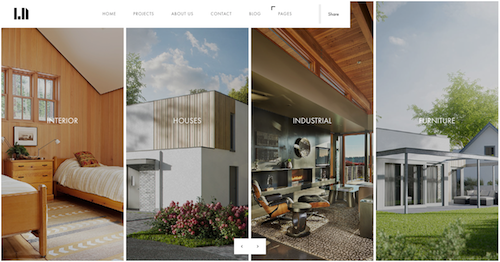 The Architec WordPress theme has been designed for architectural firms, freelance architects, or designers and creatives to showcase their portfolio and projects. It has a clean and minimalist design and comes with some interesting effects. Some of the key features include: unique portfolio and project pages, left side navigation menu, 3 custom post structures, 9 unique page templates, light or dark versions, top slide with contact information and Google map, options panel and more. 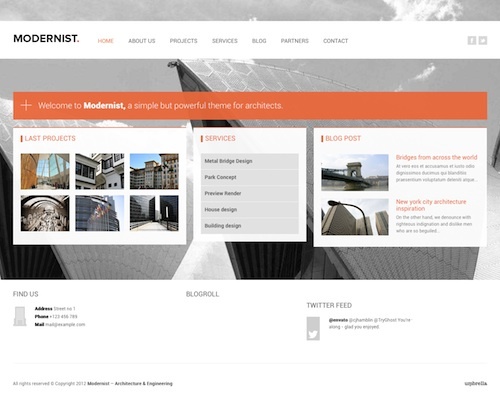 The Arkitekt WordPress theme has been designed for architect businesses. The commercial theme has a rather traditional design that might not be very inspiring but its clean and professional. Some of the key features include: visual page composer, revolution slider, powerful admin panel, WPML compatible and more. 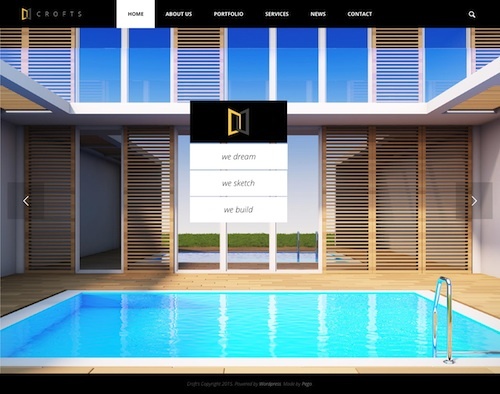 Crofts is a multipurpose WordPress theme that can be used for architecture, agency, portfolio, business sites and others. It has a unique and modern design that uses large images to ensure the focus is on your projects and portfolio not the design of your websites. 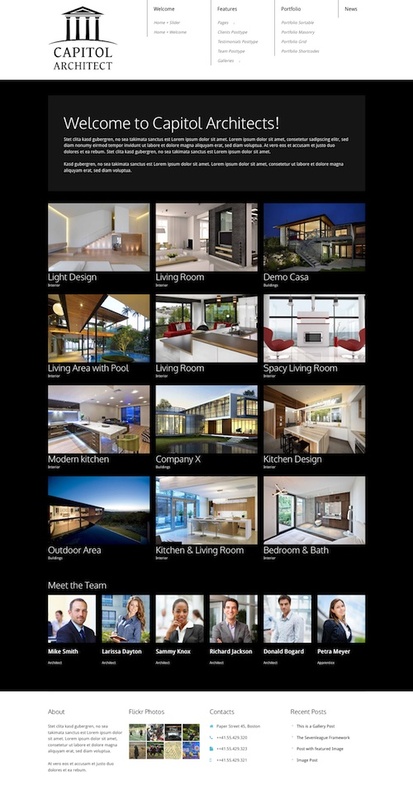 The homepage has a full screen image to capture your attention while the project portfolio index and single project pages allow you to showcase your work or projects in style. Some of the other key features of the theme include: a mobile responsive design, about us and services page, blog section, visual composer, simple theme options, portfolio views (2, 3, 4 or 5 columns), 3 different single portfolio layouts, and more. 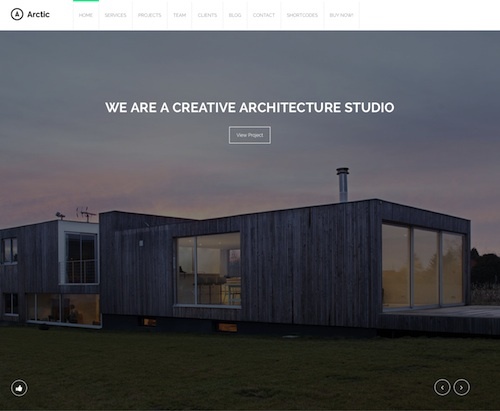 Domik is a creative and mobile friendly architecture WordPress theme. The premium theme has a modern, clean and unique design. It offers 4 different homepage styles to choose from (Slider, Carousel, Static image and Video), a visual drag and drop page builder, 7 different portfolio page styles, filterable portfolio with Isotope plugin full screen backgrounds, AJAX page transitions, powerful theme options, Google fonts, unlimited color options, page + post + portfolio setting with metabox, WPML compatibility, and more. The Modernist WordPress theme has been designed for architects, designers, freelancers, engineers, agencies, builders and others wanting a unique WordPress theme to showcase their projects and company. It features a mobile responsive design, HTML5 and CSS3, 6 page templates, 2 custom post types, a layout builder, light and dark versions and more. 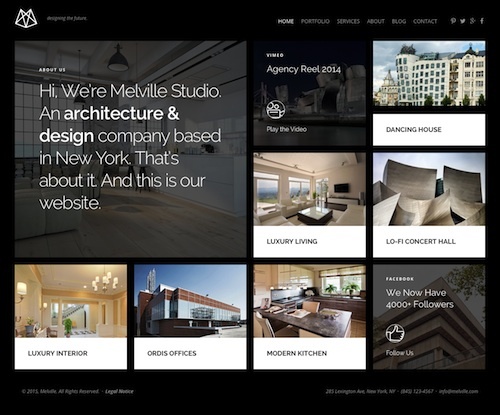 Hive is an innovative and modern WordPress theme for architecture / creative agency websites. The premium theme has a minimal and users friendly design with lots of useful features and is mobile optimized with a responsive design. Some of the key features of the theme include: visual composer to build any page layout, 4 different project pages (horizontal gallery, grid, masonry and shaped portfolios), shape masks for displaying your projects (including rectangle, triangle, hexagon, circle etc), 3 different portfolio layouts, custom project pages and case studies (with sliders, content blocks, different media types etc), 3 different header styles, light or dark color option, 600+ font options, Google maps, site borders (on or off), 2 different blog layouts and much more. Avanter is a fully featured and easy to customize WordPress theme designed for corporate and architecture firm websites. The theme is mobile friendly with a responsive layout and offers unlimited color scheme options, unlimited portfolios and is WooCommerce ready. 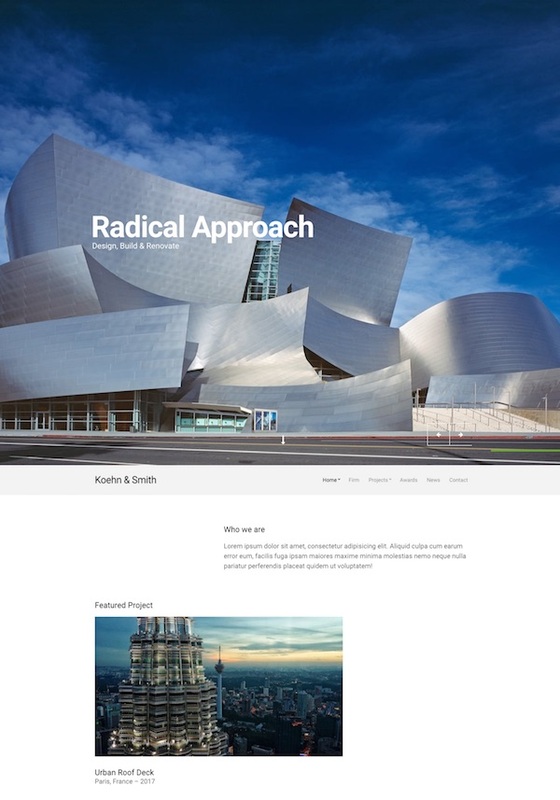 The Organic Architecture WordPress theme has a unique, contemporary and minimalist design ideal for any type of architecture studio. It offers 4 different homepage options (mosaic, video, horizontal and portfolio box), masonry layout, custom post types, layout customization options, 2 different menus, mobile responsive layout, rich options panel, CSS3 animations, custom widgets and more. 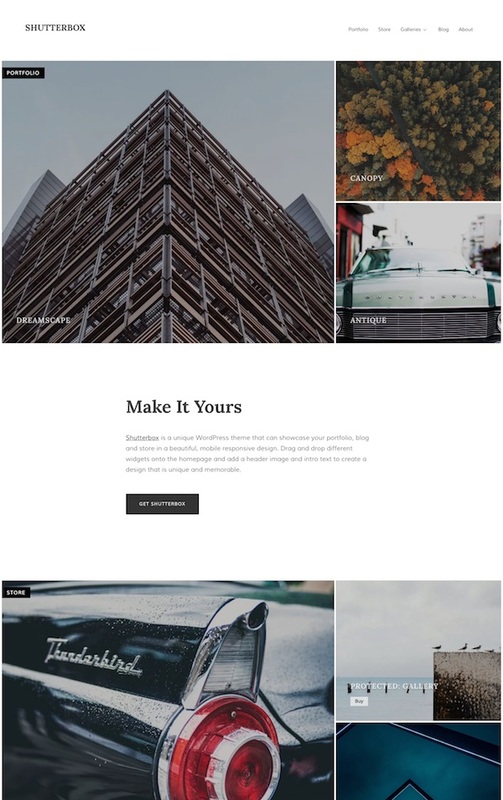 MIES is a modern architecture WordPress theme with fancy parallax effects, full screen images and video to provide a delightful and captivating website browsing experience. The premium WordPress theme is ideal for architecture firms to showcase their project portfolio and company information. It has a great portfolio system to showcase your projects with fullscreen images, striking galleries and precise type along with a simple to use, but highly capable filtering system. Some of the other notable features of the theme include: parallax scrolling, responsive and mobile friendly, live customizer (to easily change fonts, colours, layout sizes etc), clean code, powerful and extensive options panel, visual shortcodes, 600+ Google fonts, one click demo content install, social and SEO optimized (Facebook open graph meta tags, Google plus meta tags, Schema.org markup), unlimited colours, and more. The Future Architecture WordPress theme is designed for architect or general business websites. The theme has an attractive yet functional design that allows you to display your projects and all the information about your company. Some of the key features include: responsive layout, drag and drop page builder, custom widgets, Font Awesome integration, filterable portfolio, parallax sections, translation ready, unlimited color options and more. Arche is a responsive WordPress theme designed especially for architecture, graphic design and construction companies. It has a dark color scheme with a detailed homepage layout that allows you to display a slider, link icons, projects portfolio, blog posts, company history, team, clients and other information. Some of the other key features of the theme include: a powerful options panel and page builder, unlimited colours, multiple gallery and portfolio layouts, Google fonts, logo uploader, custom background options, multilingual support with WPML and more. The Builder Construction Architect Renovation WordPress theme has been designed for a range of uses including architecture and engineering company websites. The premium theme has a professional and purpose oriented design with all the featured you would need in a website. It comes with opening hours, free consultation / appointment form, practice areas, case results, Q&A and team members pages. Some of the other key features include: a drag and drop builder, WooCommerce integration, responsive layout, 6 homepage styles, unlimited styles, multiple footer styles, Google fonts, icon font manager, sidebar manager, powerful theme options and compatibility with a range of premium plugins. 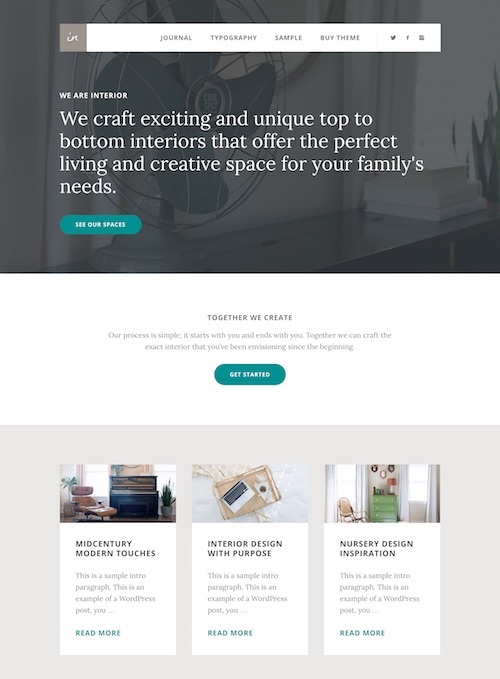 Melville is a unique WordPress theme with a grid system layout designed specifically for architects, construction companies, interior designers, house builders and related businesses. Some of the key features include: a mobile responsive retina ready layout, filterable portfolio and 4 separate project pages (project page, tiles page, slideshow page, vimeo page), services page, blog section, and more. Best Build is a corporate WordPress theme designed for construction, building and architecture companies. It has a professional design that allows you to display all your projects and company information in a great looking website. Some of the key features include: 4 different header style options, detailed about company pages, custom projects page options, service page options, team page options, careers page, news blog, visual composer, mobile responsive, translation ready, WooCommerce ready, Font Awesome icons, HTML5 and CSS3 coding and more. ORIEL is a mobile responsive WordPress theme designed for architecture, interior design, decoration, renovation, and engineering companies. It features a bold, modern and minimal design that is quite unique and will make your company stand out from the crowd. Some of the key features include: unlimited color combinations, full-screen responsive and touch friendly image and video galleries, unlimited sidebars, responsive carousels, custom projects type with category support, accordions, horizontal and vertical tabs, shortcodes and more. 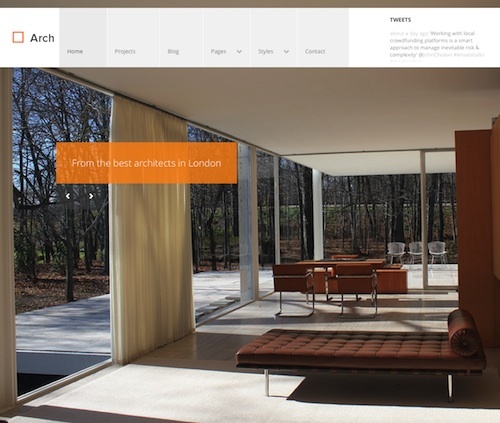 The Rayleigh theme has a clean, elegant and minimalist design that is made for architects, designers and builders to showcase their projects and work. Some of the key features include: fully mobile friendly responsive design, light or dark skins, full screen home image or video slider, portfolio filtering, animated menu, 7 different page templates, Google fonts, Font Awesome icons, valid HTML5 and CSS3 coding. Arkitek is a business WordPress theme from Themeisle that would be suitable for an interior design or architecture company. The theme has a professional, traditional design that allows you to display your projects, services, team and other information about your business. It has unlimited color options, theme options panel, custom widgets, localization options and a mobile friendly responsive design. 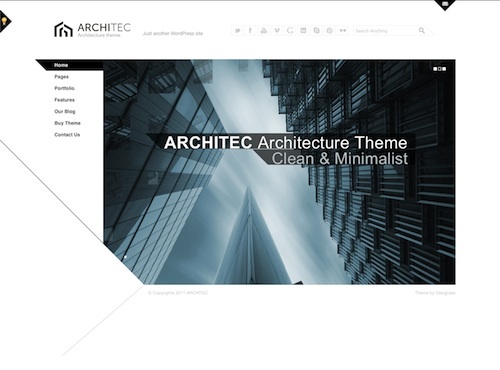 Arch is a clean, minimal and easy to customize WordPress theme that’s made for architects. The homepage uses a large featured image and unique navigation menu. It has a projects page, mobile friendly design, custom background images, theme options, various custom widgets and page templates, custom post types for projects, services and team, language localization options and more. Circum is a multipurpose corporate / create WordPress theme that could be used for a wide range of businesses or project websites. It has a clean, modern and creative design that makes good use for images to clearly present your products, services and business information. It comes with a lot of theme options and if fully compatible with the WooCommerce plugin for ecommerce functionality. Studio 8 is a business / corporate WordPress theme from WPLook Studio. The premium theme has a bold, modern and simply eye catching design that allows you to showcase your projects, work and services in a professional manner. The theme is really versatile and has a lot of layouts and customization options. It would be ideal for agencies, businesses, companies, startups or any other web project. Some of the key features and benefits of the Studio 8 theme include: large full screen feature image or video on the homepage, multiple custom project and page layouts, mobile friendly responsive design, advanced theme options, custom post types and widgets, custom backgrounds and header image, full HTML5 and CSS3, fast clean code, multiple widget areas, mircoformats, 2 blog layout options, and more.